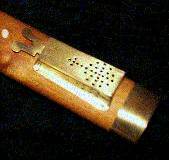 began his apprenticeship as a woodwind-maker in 1978 with the Moeck manufacturers in Celle. After qualifying he soon became head of the tuning department for recorders, and in particular took care of the new development of recorders and other woodwind instruments as well as maintenance. He was also responsible for the training of the young apprentices. 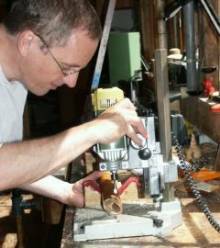 In 1992 he became a master woodwind-maker and soon founded his own workshop. The development and hand-finishing of instruments, such as Renaissance and Baroque recorders as well as dulcians with different pitches and tunings, fascinates him today as much as it did when he started out on his own. Martin Praetorius does not turn out mass-produced instruments but instead gives each instrument its own personality. The highest musical demands are satisfied through his skillful craftmanship and more than two decades' experience. The personal contact to the customer is very important. The instruments, which are in use, are been maintained carefully and kindly. The special players wishes regarding sound, response and pitch are been recognized as far as possible.